Hello friends, we have been having a lot of doubts regarding the new Lenovo Vibe K4 Note which has been just launched this month on Amazon.in. Well we have collected few questions and have the answers to them which will clear most of your doubts and confusion before purchasing the Lenovo Vibe K4 Note. NOTE : If you think the answers are incorrect or not relevant then please feel free to leave a comment at the bottom of the article. 1.Does this have Turbo/fast charging? 2. Does it support VoLTE/HD calling? 3. Will it be available in the store? As of now only available on amazon.in as part of Flash Sale. 4. How much memory will I get out off the box? Around 8.38 GB is free out of 16GB. 5GB is stored for OS and other memory are occupied by some videos and built in apps(Like MX player and Asphalt 8, which was installed in the unveiling show). Some of these bloatware can be uninstalled. 5. Does it have back-lit keys? No,the capacitive navigation buttons are but not back-lit, they are silver coloured and shiny. 6. Can I buy it now? 7. What type of SIM is used? Both the SIMs are Micro-SIMs. both are 4g enabled. Dual stand by. 8. Is this the only model available? No, there are totally 4 models which are to be released by the company (this is confirmed, not a rumor). 9. Will there be a white model? Yes, and its already been sold in other countries. 10. What is its SAR Value? 12. Can we record in 4K video format? 13. can we change the themes to customize the phone? yes, there is a dedicated app for this, called the “Theme Center”. 14. Can we record slow motion videos? 16. Does it have double-tap to wake up? 17. Is the processor Mediatek MT6753 any good for gaming? Is it bad? There is popular misconception that processor alone handles the gaming of the phone. in this phone, and also in any android phones, the gaming is handled by separate gaming chip. In this phone, it has Mali T720-MP3 (Up to 450 MHz 3D graphic accelerator) which is very good for high end gaming. 18. Is the processor better than which is present in K3 Note? yes, it is a upgrade in the processor but not in terms of speed. Its a true octacore processor, which means there is no 4+4 core but single 8 core processor. 19. Will there be Android M update? This phone was rumored to be released with M out off the box, but according to top source there will be a definite update but there is no specific timeline about when exactly will it be updated. 20. Is it bigger than K3? Yes, it is bigger(fatter) than K3. Only but few mm. 21. Will there be any phone case available to buy to protect the phone? There will be a transparent case bundled in the box. There are things that both phones are on the same level and many important things that makes K4 stand out. (a) First important difference is Screen Resolution. K4 has FHD screen with 401ppi, but Coolpad has only 267ppi. (b) K4 is protected by Corning Gorilla Glass 3 and Coolpad doesn’t. (c) Dolby Speakers in K4 and an average stereo speaker in Coolpad. (d) Presence of NFC in K4. (e) K4 battery is 300 mAh more than Coolpad. 23. What kind of headphones are available in the box? No headphones are available in the box. 24. Is the SIM slot a hybrid SIM slot? No, separate SIM slot and separate microSD card slot. 25. Does it have LED notification light? It has multi coloured notification LED light. 26. Does it support OTG? 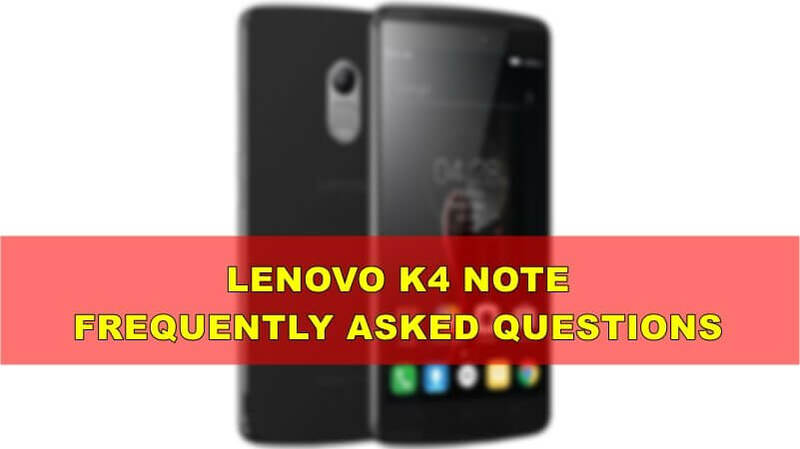 These where the FAQ’s asked before purshasing Lenovo Vibe K4 Note on several groups and blogs and the answers are given, we hope we’ve served you well. Happy purchasing!